I had my first contact with angels when I was a child! It happened quite unexpectedly. I was 8 or 9 years old! It was the day of Christmas Eve. My father wanted to bring down a box of Christmas decorations from the attic. In order to do this, he had to lift a very heavy floor panel, that was hoisted to a pulley by ways of a steel cable that ran over a cable roll. A large bucket filled with concrete was attached to the other end of the cable as a floating balance weight to make it easier to lift the hatch by pulling on the weight of the bucket. There was a loud bang. As the hatch was lifted, the cable roll, which was attached to the pitch of the roof, was torn off. With a loud racket, the bucket of cement shot down with all its weight and so did the hatch! Thus forewarned, my father reacted quickly and pulled his head out from under the hatch just in time. It could have struck him dead or broken his neck. That didn’t happen, thank God! But who was it that gave the warning? Who was it that spoke a warning through me as a child just in time to prevent the disaster? It was a guardian angel. I give thanks to this angel for his terrific life-saving help and his supporting, loving protection! Do I have to believe in angels to have them enter into my life? I’ll take the liberty to say, they are already present! (see story: My first contact with angels) At that time, the child I was, who spoke the message of the guardian angel, didn’t ask herself, „Do I have to believe in angels?“ In this instance a guardian angel offered helping action without asking and it was my first conscious experience and meeting with an angel. No belief system is necessary. Opening up is sufficient. 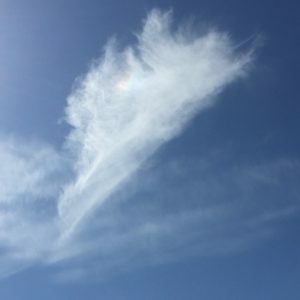 The angels are interested in seeing you envisioning yourself as part of the divine creation; that you can use the heavenly powers cooperatively to open your heart for change towards peace, freedom, love, and to create healing impulses for the good of all of being and for yourself. The angels are aware of such positive intentions and guide you, foster you, bestow you with abundance! And as you read these lines, it is a welcome sign to you, the brush and contact with an angel! S(c)ent from heaven with love!